May is that special time of the year when summer is just around the corner. 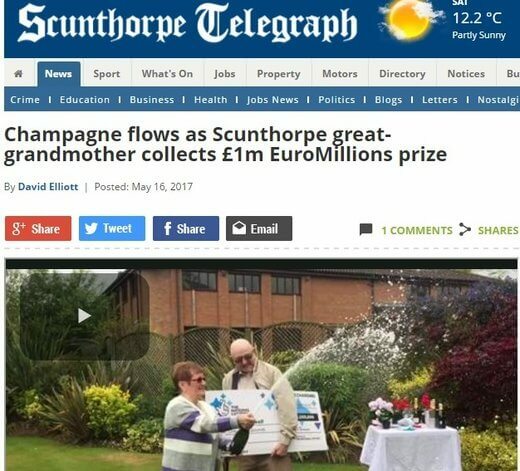 But from now on, Annie Showell of Scunthorpe will most likely remember May as the special month when she won the lottery. The great-grandmother’s ticket won the millionaire raffle draw on May 2nd. That made her an instant millionaire. She and her husband John have since turned up at the lottery offices to collect the prize. The couple celebrated their lottery victory with champagne at the Forest Pines Hotel and Golf Resort, where they received their ceremonial check a full two weeks after the draw. She is said to be keen on purchasing a new house while husband John is eyeing a BMW. The rest of their winnings will make their retirement very comfortable.